The scientific evidence behind why maintaining a lifestyle more like that of our ancestors will restore our health and well-being. Civilization has rapidly evolved, our bodies have not kept pace. This mismatch affects every area of our lives, from our general physical health to our emotional wellbeing. 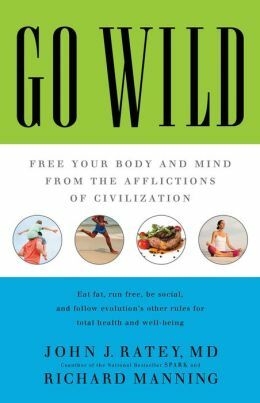 GO WILD examines how tapping into our core DNA combats modern disease and psychological afflictions, from Autism and Depression to Diabetes and Heart Disease. By focusing on the ways of the past, it is possible to secure a healthier and happier future, and GO WILD will show you how. SPARK is a groundbreaking exploration of the connection between exercise and the brain’s performance that shows how even moderate exercise will supercharge mental circuits to beat stress, sharpen thinking, enhance memory, and much more. SPARK will change forever the way you think about your morning run---or, for that matter, simply the way you think. For those who wish to learn about ADD, or who have been recently diagnosed with ADD, Delivered from Distraction is a thorough introduction to what ADD is, how it is diagnosed, the biological roots of ADD, and strategies for treating and succeeding with ADD. Dr. John Ratey, explains in lucid detail and with perfect clarity the basic structure and chemistry of the brain: how its systems shape our perceptions, emotions, actions, and reactions; how possession of this knowledge can enable us to more fully understand and improve our lives; and how the brain responds to the guidance of its user. Drawing on cutting-edge research, Drs. Ratey and Johnson challenge the most basic beliefs of our mental health professionals by uncovering the biological factors that often determine our personalities. They use real-life case studies to illustrate how shadow syndromes affect our everyday lives and how they can be treated--often dramatically--with diet, exercise, psychotherapy, and medication. This title in the "Neuropsychiatry" series discusses the neurological and psychiatric basis and treatment possibilities of anti-social behaviour and other personality disorders, both idiopathic and those associated with substance abuse, attention deficit, schizophrenia, frontal and temporal lobe epilepsy. This reflects the awareness of the structural, biochemical and pharmacologic interactions of this group of patients. Although the subject is firmly grounded in science, the approach is practical and should be of relevance to the clinician in his or her daily practice. This volume is designed to further our understanding of the pharmacologic treatability of the mental illnesses that individuals with mental retardation often display. The book shows patients can benefit from pharmacological interventions that are part of a multisystems approach to treatment, the aim of which is to maintain or increase the cognitive functioning of the individual. In this respect, pharmacologic and polypharmacologic approaches are sought to provide more efficacious, less toxic treatment regimens for these patients. New insights into the nature of neurological disturbance in mental retardation are presented, and the book offers a practical guide to the treatment of developmentally disabled people.